Oxycise! Level 6 Workout MP4 – Oxycise! Join Aubrey Lee once again in the beautiful outdoors in our newest workout for some flexing, slimming, and toning. Boost your metabolism and increase your strength and flexibility with thirty new positions in the Oxycise! Level 6 Full Body Workout. “I saw you on QVC and thought — what the heck — who doesn’t have 15 minutes and the cost was nominal. “Well, Oxycise! has changed my life!! “I got your program about 4 weeks before March 19th. I started on February 17th. I went to try on dresses again on February 18th and found one I liked. It was a little tight. By the wedding, I was down to a size 14 (I just turned 51 and that’s not easy to achieve) and the dress fit perfectly. I no longer hate to go try on clothes. Everyone at work as well as my husband and my family say I am starting to look like my old self. This is a challenging workout for me. I love it. I don’t like the music beds in any of the Oxy workouts and 6 seems even louder than the others. 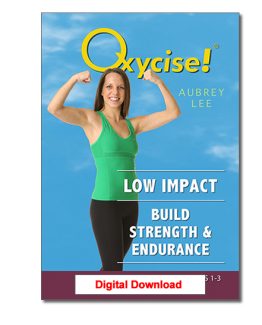 I wish they would provide a clean version for download of all Oxycise workouts. And when they do, I will be here giving all the Oxy workouts the five stars they deserve. I’ve been on vacation so haven’t had much time to spend on Level 6 since I downloaded it. But what I have done I really like. I tried working out with the trainer at our retirement community (I’m 75) but feel I get a much better exercise workout with Oxycise. My back was hurting with the trainer and I don’t have those problem with O. Thank you!